Sisters Uncut May Day action. Credit: Eilidh Macpherson. Building movements that are truly liberating takes heart and soul. Recently, from #BlackLivesMatter to the Scottish Independence Campaign, organised movements have challenged power both outside and within us. We can’t change where we’re from, but we can work towards understanding the privileges that are afforded to us because of who we are and what our background is. Confronting power in a movement means working together to unlearn oppressive behaviours that stem from these privileges. Being part of a movement forces us to confront ourselves, and how we relate to each other. The emotional journey this confrontation provokes brings us closer to long-lasting social transformation. But getting to a point in mainstream activism where issues of power and privilege are even acknowledged, let alone explored, has taken too long. It has needed too much effort. In the process, gaining this recognition has often caused unnecessary hurt. As three women activists, we can recall some rare, magical moments where skilled organisers have channelled emotion and vulnerability through a group of activists in order to build trust and expose hidden prejudices. We have explored what oppression means in our lives, and how others can become true allies. In such spaces, we haven't shied away from the uncomfortableness of confronting privilege, or the hurt caused by oppression - but used these realisations as forces for good. These moments can only come about through a commitment to learning and unlearning: a commitment that challenges both ourselves and those around us. In bringing power and privilege into the centre of everything that we do, we begin to engage in heart and soul activism. For many who proudly identify as doing their bit for the cause; power and privilege has become a tick-box exercise, an acronym on a page, an item on the agenda. For others where there is a willingness to learn, there is also a fear of being isolated for doing something “wrong”. The reality is there is no easy way to transform the pain of collective oppression into strength, especially if we only organise in groups of people that look and act like us. We take “Training not Shaming” as an important mantra in our journey together. We should seek to be radically open to learning from each other, with the hope that collaboration and exchange build steps towards collective liberation. What does heart and soul activism look like? Here are a few groups we’re particularly excited about who have moved beyond looking at power and privilege as an isolated issue. They have dedicated their daily practice to unlearning attitudes and behaviours that are exhibited through holding privilege. They have made liberation their sole purpose, through their chosen activities and who they have decided to work for. These groups are explored below as starting point for what we hope to be a much longer conversation. Trainees and organisers of the fourth Bootcamp. Credit: Campaign Bootcamp.Campaign BootcampThis three year old organisation has gone from strength to strength. 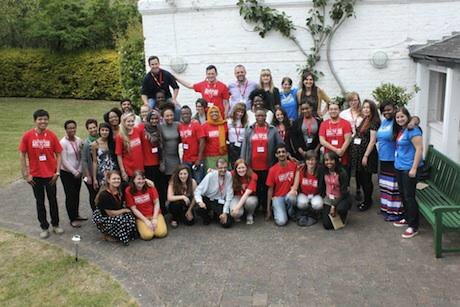 Bootcamp is a renowned training programme that supports some incredible individuals to become great campaigners. They take highly diverse groups through a week long training on campaigning strategy and skills, whilst embedding the values of liberation into their purpose and activity. Bootcamp are proof that diversity builds strength in groups - and this is key to the journey each campaigner goes on through their week together. Their scholarship system ensures no one is left out of an opportunity to apply, and they rely heavily on the generosity of larger NGOs to subsidise more places - encouraging a behaviour that is often hard to find within the sector. All this is encased in a teaching methodology that truly liberates - working off of the US training gods at Training for Change. This group of self-defining women, and those who experience oppression as women, take direct action to highlight and fight against life-threatening cuts to domestic violence services. Since their inception they have worked hard to ensure that their spaces don’t replicate wider society’s oppressive structures. In doing so they are not only strengthening their community but are organising effectively and mobilising hundreds of people to make noise where it matters. Intersectional feminism underpins all that they do – and they work with other groups such as The London Latinxs and Black Dissidents on interconnected struggles. Similarly, these groups are also anti-oppression campaigners taking direct action, with The London Latinxs focusing on highlighting issues faced by the Latin American community in London and around the country, and Black Dissidents building a community of black and brown activists fighting against white supremacy and hetero-normative patriarchy and the consequences of both. 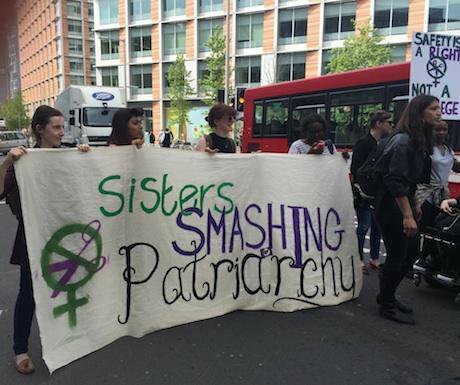 Sisters Uncut have not only been instrumental in raising the danger of cuts to domestic violence services but are there to show solidarity with other causes also fighting violence against women such as the movement trying to shut down Yarl’s Wood detention centre. Janelle Brown of Sisters Uncut told us: "[We’re] growing week on week, with a diverse collective of women empowering each other to take bolder and bolder action for domestic violence services. There's no doubt we'll be even bigger and stronger than we are now, and we'll continue to grow until the government meet our demands". Some of the team at Media Diversified. Credit: Wasi Daniju. Media Diversified recently celebrated its second birthday. 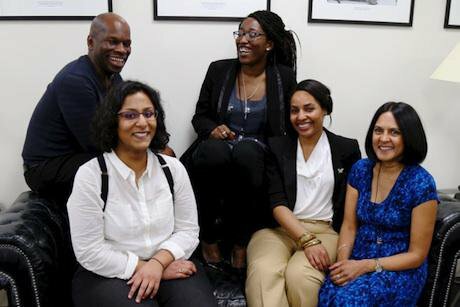 They were founded with the aim of diversifying the UK’s media, and since have propelled themselves to the forefront of discussions around this lack of diversity. They routinely use their various platforms to call out the media’s pretty overt racism, and also run campaigns around this, such as #AllWhiteFrontPages, which highlights why the stories of ethnic minority groups need to be included in coverage. By being generous with support and contacts, they offer budding writers of colour resources that a lot of those that find themselves working in the media are granted through private schooling and elite universities. They use their website to promote writers (including via this ever-growing experts directory), and the opinions and facts that mainstream media benefits from dismissing or completely ignoring. They’re diversifying the UK’s media and getting more ethnic minority views out there. Listening and learning from those around us is one of the best ways of challenging power and privilege in our own work and communities. There is a plethora of resources out there - they’re a starting point for us to school ourselves on privilege and start to unlearn the oppressive behaviours and practices we may not even be aware that we are doing. We’re always conscious that a lot of people, for varying reasons, may be not know where to begin this journey, so we worked with others to pull together this introduction - it’s meant to offer direction to those wishing to strengthen their own liberation practices. If we can provide a space to openly discuss our experiences, reflect on them collectively and apply learning to our work - we begin to see some great things happen. Feminist wonder woman bell hooks refers to this specific kind of conversation as a “dialectical exchange”; a learning that increases radical openness and a commitment to change. We want this to be a starting point – so you can go on to learn and unlearn about privilege and oppression, have conversations that matter, build friendships and communities, to come together and do activism with real heart and soul.